The gearbox adds about six pounds to the bike, but that weight's concentrated around the bike's crank, making for a fairly well-balanced ride. Crowds usually line up at the Reeb booth at the North American Handmade Bicycle Show for the free Oskar Blues. But this weekend, people were trying to get a closer glimpse at a new gearbox having its unofficial coming out party on American soil. Reeb is one of the first American companies to incorporate the German-built Pinion gearbox on one of its bikes. The 18-speed gearbox is mounted to a specially modified Reebdonkadonk rigid fatbike frame. The Gates belt drive propels 29-inch wheels mounted with 3-inch-wide Surly Knard tires. "We're all single-speeders at heart," said Reeb's Chad Melis, "but we also like the challenge of doing something different. We do a lot of riding on snowshoe-packed singletrack in the winter; snow conditions are so variable, we realized we needed gears to effectively ride the terrain." Reeb wanted to continue using the belt drives they'd had success with, so a chain-based drivetrain was out of the question. They toyed with the idea of an internal rear hub, but didn't like the idea of adding additional weight to the rear of the bike. 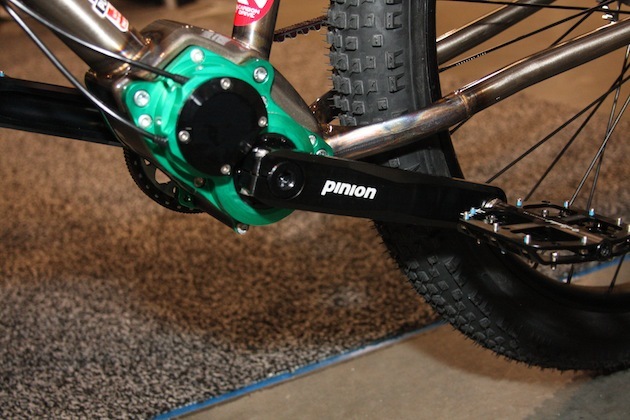 Pinion gearboxes have been increasing in popularity in Europe, particularly on rugged touring bikes. Pinion was looking for a way to slowly ease into the U.S. market and saw the potential for a long-term partnership with the small Colorado-based builder. Reeb is one of the first American companies to incorporate the German-built Pinion gearbox on one of its bikes. The gearbox adds about six pounds to the bike, but that weight's concentrated around the bike's crank, making for a fairly well-balanced ride. The finished SFPinion + displayed at NAHBS weighs about 31 pounds, which could be considered a little beefy for a rigid bike. 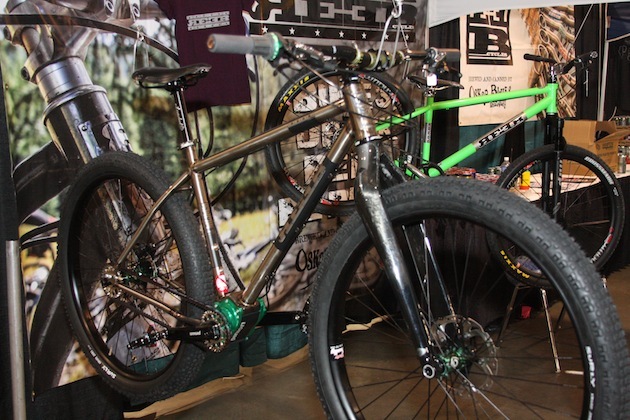 Although I wasn't allowed to take the prototype outdoors – apparently I look a bit too shifty to be trusted – the Reeb guys did consent to a quick spin around the Charlotte Convention Center. I was impressed by how smoothly and silently the bike shifts. Gates' Paul Tolme claims the Pinion's gear ratio is wide enough you could even climb a tree in the low gear, but unfortunately I wasn't able to find any suitable redwoods in the convention hall. Pinion claims the bike has a gear ratio of more than 630 percent, much more than any derailleur or hub system. With Pinion being so new to America, good luck finding any local mechanic to repair the drivetrain if anything goes wrong. However, the gearbox is well-constructed and completely sealed, so routine maintenance is an afterthought. Pinion claims an average lifespan of more than 60,000 kilometers. Pricing details are not yet available. Fabricator Chris "Soul Train" Sulfrian said the current prototype would make an excellent Tour Divide bike, and was looking forward to trying out the gearbox on Reeb's other mountain bikes. Even more so, he and the others were looking forward to getting back home to Colorado and testing the current model on their home trails.